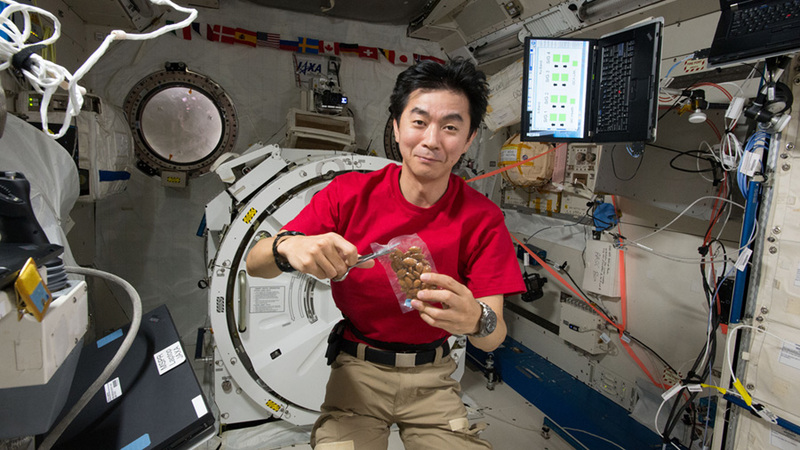 ISS044E088545 (09/05/2015) — JAXA astronaut Kimiya Yui iss seen with a packet of almonds while floating inside of the Japanese Experiment Module. The six-member space station crew is conducting human research to prepare future astronauts for long-term missions beyond low-Earth orbit including NASA’s Journey to Mars. The orbital residents are also getting ready to release a cargo craft Monday while getting ready for a late October spacewalk. Space station Commander Scott Kelly, who is comparing his body to his ground-based twin brother ex-astronaut Mark Kelly, collected and stored a urine sample for the Twins study. He also scanned his legs with an ultrasound for the Sprint fitness study with some assistance from Japanese astronaut Kimiya Yui. NASA astronaut Kjell Lindgren partnered with Yui for ultrasound scans of the eyes and an echocardiogram of the heart for the Ocular Health study. The duo then moved on to tool collection for a planned October 28 spacewalk by Kelly and Lindgren before loading trash into Japan’s HTV-5 resupply ship due to leave the station Monday at 11:20 a.m. EDT. I share it in my social media. I asked via twitter to Space Station…Which food astronauts eats in Space Station? I would like ask yours too.